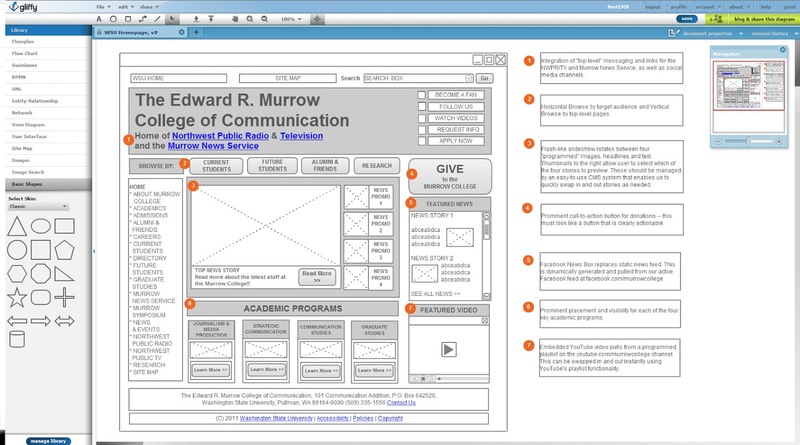 A wireframe represents a visual sketch that can be used in planning your website design and functionality. It typically happens prior to the actual building of the website - so that you can review and refine key decisions prior to any actual coding or creation. Gliffy.com enables you to build a "wireframe" and site maps for your website. This easy-to-use service can be used to sketch and create your wireframe on the web -- and then share your creation with other stakeholders. 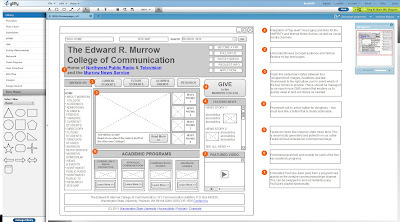 An example of the Gliffy.com interface and a wireframe. You can use Gliffy.com for website wireframing, flow charts, org charts, site maps -- and even a SWOT Analysis! Check out even more examples of wireframes on Google Image Search!